The One-Point-Ionizer OPI was developed for the neutralization of smallest parts. Emitting positive and negative ions, this unit neutralizes reliably spot charges. 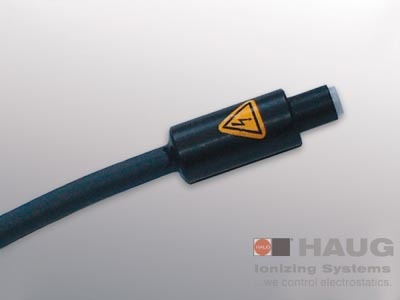 This ionizer is perfectly suited for mounting in places where there is little room. The plug of the electrode must simply be connected to the high voltage transformer (power pack) and the unit can be quickly set into operation without tools. The One-Point-Ionizer OPI has proven its value repeatedly in daily use. The OPI can also be equipped with compressed air (Mini-Jet Ionisator). Attention: The pin carries high voltage and must not be touched while in operation. We recommend regular cleaning of the electrode as dirt may cause considerable loss of efficiency. The regular use of the HAUG special cleaning agent SRM 1 and of the cleaning system RS 1 guarantee constant efficiency of the ionizing unit.